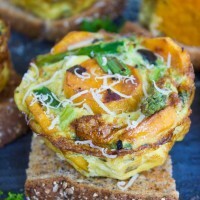 This Kale Veggie Mini Frittata recipe is the perfect breakfast.. Serve these easy baked mini frittatas on whole grain toast with a sprinkle of Parmesan for a healthy spin on a classic egg breakfast. A good healthy breakfast is always on the “to do” list of many of us. For some reason, there’s never enough time or enough ideas. This Kale Veggie Mini Frittata recipe is the perfect breakfast to fuel you up with the goodness of veggies and eggs. 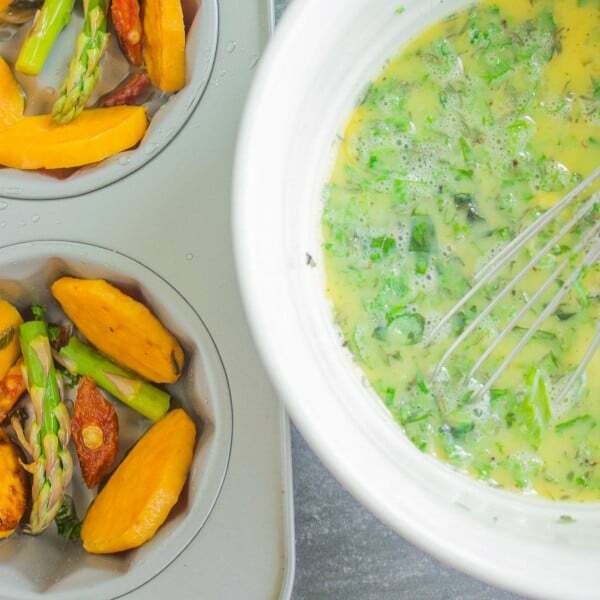 Tender pan cooked veggies are arranged in a muffin pan and a mixture of eggs, herbs, and kale is poured over them. These mini goodness bites are baked and served on whole grain toast. Top them with a sprinkle of parmesan and more kale—the classic egg breakfast made easy, healthy and delicious! This recipe for Kale Veggie Mini Frittata is packed with proteins! So healthy and great for gluten-free diets if served on gluten-free toasted bread. 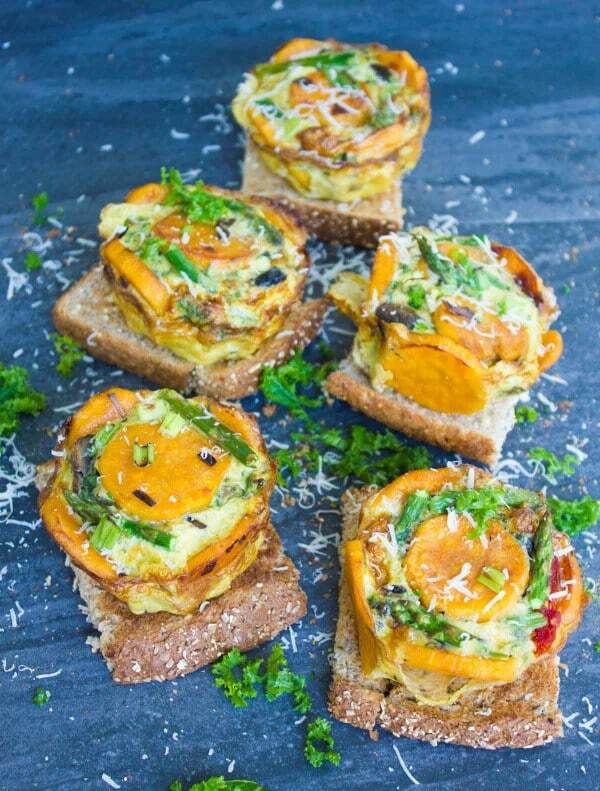 The beauty of these kale veggie mini frittatas is you can use any veggies you like or have on hand. You can roast them, fry them, boil them, pan sear them—however you prefer! In this recipe, I sauté some scallions, sweet potatoes, sun-dried tomatoes and asparagus for 1 minute. Then I lower the heat and cover the skillet for 5 minutes until the veggies are tender. I find this way to be one of the best methods to cook vegetables without losing their nutrients. Then I cover the bottoms of the muffin pan with some veggies and pour a mixture of beaten eggs, chopped fresh kale, fresh basil and parsley on top. These Kale Veggie Mini Frittatas bake for 8 minutes until the eggs are puffy and done. I let them cool for just a minute and then serve them on toasted slices of whole grain bread, with a nice sprinkle of fresh parmesan and extra chopped kale. 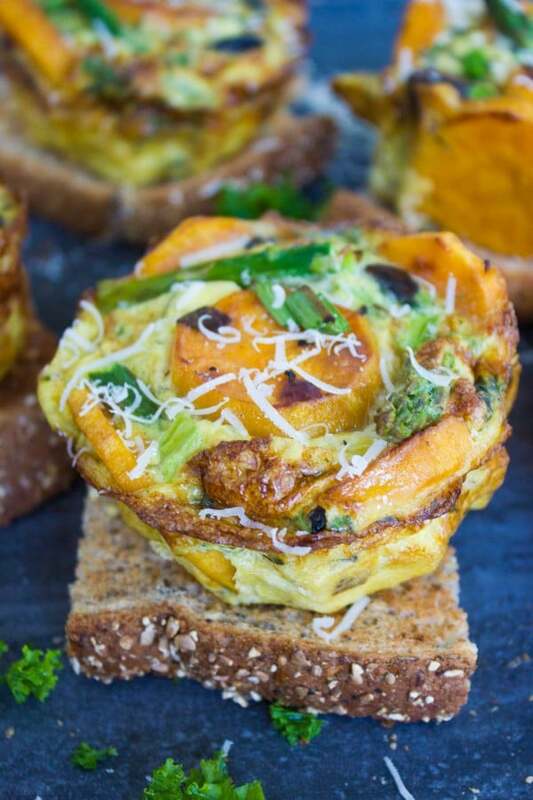 These kale vegetable mini frittatas make the perfect breakfast! They are packed with vegetables, super kale and eggs! Talking about protein! And they’re a really great way to eat more veggies—an everyday challenge for many! Plus they need maximum 20 minutes from start to finish, and even less time if you’re vegetables are ready beforehand. Speaking of preparing in advance, if you happen to have a nice vegetable dinner, save some for these kale vegetable mini frittatas! For this easy recipe, you can use any veggies you prefer. 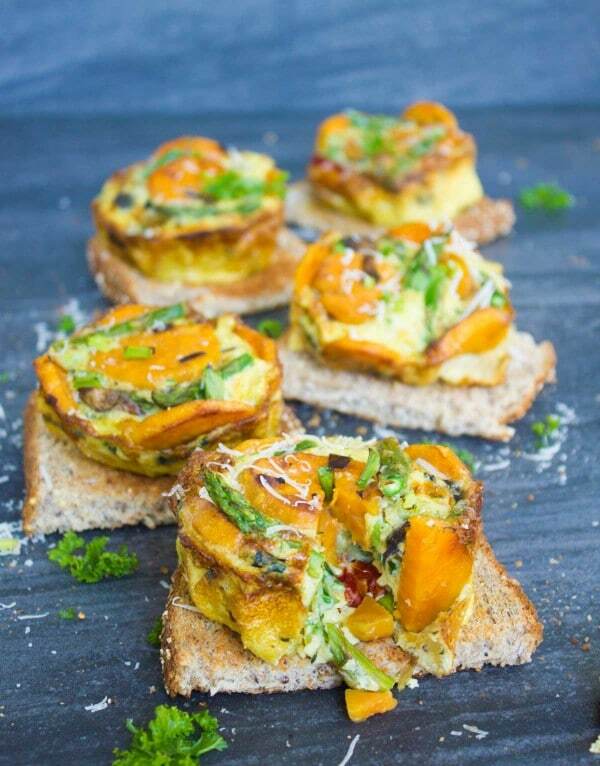 Just store them in your fridge until frittata time, then all you’ll need to do is beat up the eggs with kale, herbs, pour and whip up these gorgeous Veggie Mini Frittatas within no time at all! Adding pesto to these Kale Veggie Mini Frittata recipe makes for a nice Mediterranean flavor. Before baking these Kale Veggie Mini Frittatas, sprinkle them with some grated or crumbled cheese of your choice. Season your mini frittata with your favourite spices and add some chopped cooked chicken or turkey for a non-vegetarian version. Want to make it an extra light an low-cal breakfast? Why not make it an egg-white kale vegetable mini frittata? Just skip the yolks! You can make this mini frittata recipe in a large skillet and cut it up into wedges. Simply adjust the baking time to 20 minutes at least. 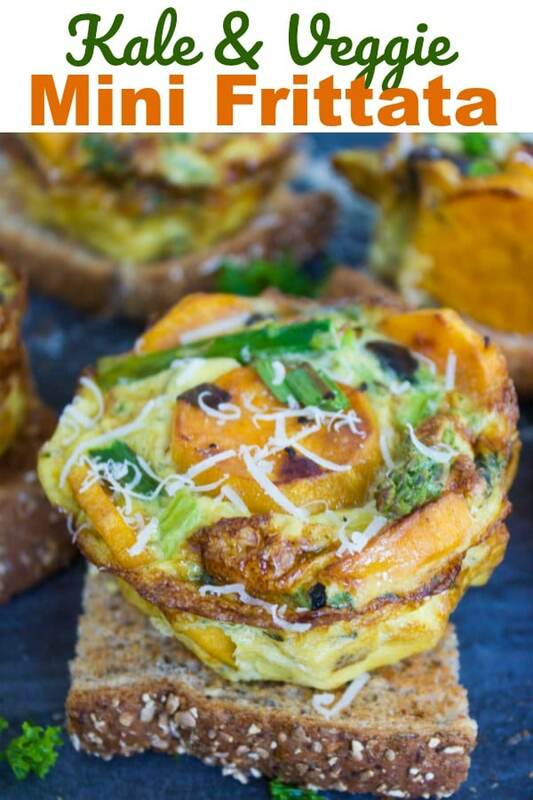 This Kale Veggie Mini Frittata recipe is the perfect breakfast to fuel you up with the goodness of veggies and eggs. 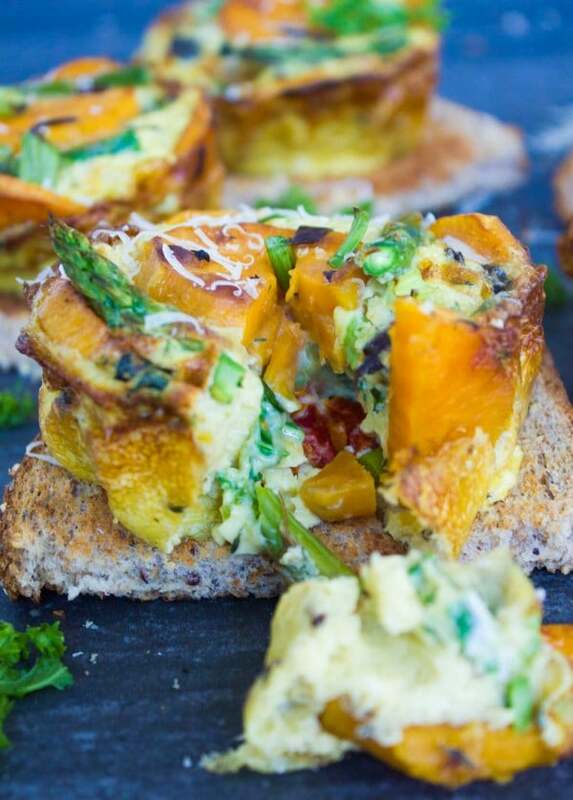 Serve these easy baked mini frittatas on whole grain toast bread with a sprinkle of parmesan for a healthy spin on a classic egg breakfast. Grease a large muffin pan (1cup capacity each) or a standard size muffin pan and set aside. In a non-stick skillet over medium-high heat, melt the butter and add the scallions. Sauté for a minute and add in the sweet potatoes and sauté for another minute. Add in the asparagus and sun-dried tomatoes and sauté for 30 seconds, then lower the heat to low and cover the skillet with a lid. Let the veggies slowly cook and soften up on low heat for about 5 minutes. While the veggies are cooking, in a large bowl, beat the eggs, milk, kale, herbs and seasoning. 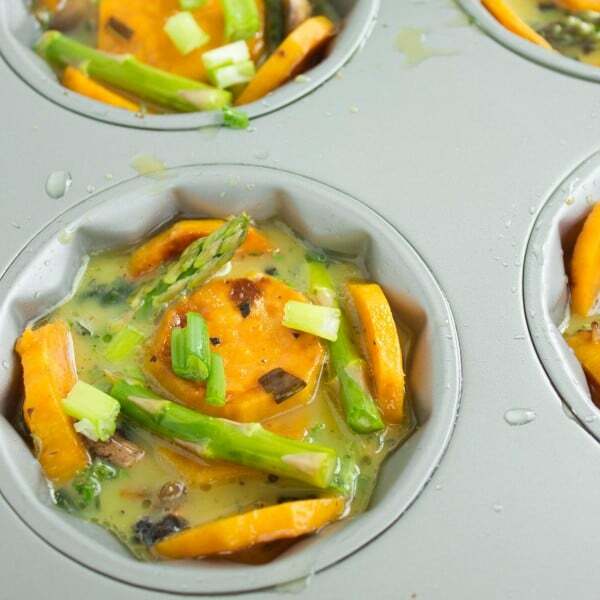 Arrange the slightly cooled vegetables in each muffin pan cavity in any way you prefer. Pour the egg mixture dividing it evenly over the veggies. Bake the frittatas for about 8 minutes (depending on the size) until eggs are puffed and cooked through. Remove them from the oven and allow them to cool for 1-2 minutes. Gently remove the frittatas from the muffin pan and then serve them not heir own or on toasted whole grain bread (or gluten-free bread if needed). So, a serving is 3, correct? Just a question. Do you use the kale stems and wouldn’t they take the place of the asparagus? I think I would use all of the kale and no asparagus, especially since they are not in season at the same time. I love muffin tin foods and I’m adding this one to my collection. AMOUNT QUESTION ….. YOUR I CUP CAPACITY MUFFIN TIN …… DOES IT HAVE 6 CAVITIES ? JUST WONDERED HOW THE RECIPE IS FOR 4 SERVINGS . DO WE GO “SHARSIES” & HALVE THE SPARES ??? These look yummy. Two ? – how long do they keep in fridge and could they be frozen. I’m trying to create some recipes to take up to a cottage. Hi Margaret, Thanks–they are really yummy! They could be chilled and then warmed up in a low oven (300 degrees F) for a few minutes. I would suggest heating them in a muffin pan (if it’s not much hassle to pack up the muffin pan with you 🙂 ). Enjoy! What is the bake time for jumbo size and standard size? Hi D, It’s about 12-15 mins max depending on how well calibrated your oven is. The frittatas will puff up and won’t jiggle when you shake the pan. I’m still confused about the serving size. Is that one large muffin each? Or two small muffins? Serving size is 1 large muffin or 2 standard size muffins. Do you have the large muffin pans ( i.e 6 per pan) or standard size ( i.e 12 per pan)? I cannot wait to make this for the family, I know they will love it! This is my kind of dish! I love everything about it! I think we will be having breakfast for dinner tonight! This is a great brunch idea! Love the use of kale! mmm I want to try it for lunch. Love this recipe! Looks yummy. Thank you. 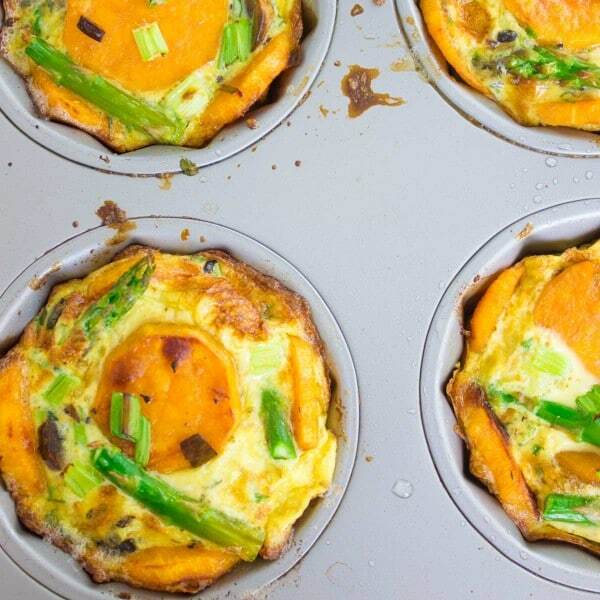 Perfect for breakfast, for lunch boxes even for dinner with a lot of veggies! I love this healthier version! Very tasty and quite original. I love it! I am going to try this out. Thank you. Such a great idea! I can’t wait to try these!! YUM!! These look like so much fun! I can’t wait to try these out !! Looks fabulous! This is my kind of breakfast, such a perfect way to start my day and I’m so excited to make this! 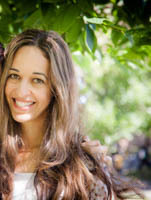 Can’t wait for you to try these Melanie! I’m loving this flavor combo! The perfect way to get in a serving of veggies in the morning. Love the minis! Perfect for my kids! Oh yes Jessica!! Kids seem to enjoy these mini treats!